Going on Honeymoon? Then why not let us take you there! 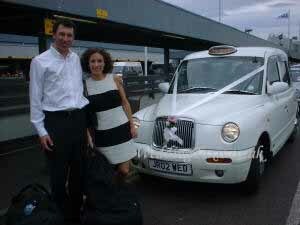 We can transport the bride and groom in one of our white London Taxis to any Airport, Seaport or Hotel either on the day or night of the wedding or any day after the Wedding has taken place. We will decorate the Taxi with ribbons and flowers just as if it were transporting the happy couple on their Wedding day. Just give us a call for pricing and availability.